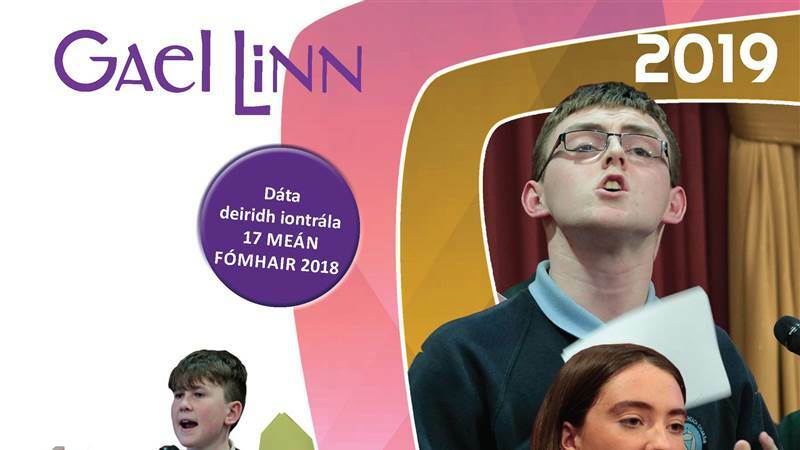 Comórtas Uí Chadhain Gael Linn 2019 Debating Champions Celebrate! Well done to the debating teams from Conamara and Kerry, winners of the All-Ireland Final of Comórtas Uí Chadhain Gael Linn 2019 ! This highly regarded annual event took place on Wednesday, 23 January last, in the County Arms Hotel, Birrr, County Offaly. Organised by Gael Linn, and supported by Foras na Gaeilge, Comórtas Uí Chadhain attracts the debating teams from Gaeltacht schools and Irish-medium schools, and over 50 teams have taken part in this national competition since October last.The high standard of debating at the event posed a considerable challenge to the five adjudicators, Féilim Mac Donnchadha, Áine Hensey, Íde Ní Uallacháin, Seán Mac Labhraí and Eoghan Mac Cormaic, in their task of selecting the winners ! In the junior section of the competition, all the young orators spoke knowledgeably on the topic ‘Tá cultúr na tíre seo slán sábháilte i lámha an aosa óig!’ ( Our Irish culture is safe in the hands of the young generation! ). There were cheers of delight from their supporters when it was announced that the Pobalscoil Chorca Dhuibhne students(Páidí Mac Gearailt, Meadhbh Nic an Ultaigh and Antaine Ó Séaghdha ) were the 2019 All-Ireland Champions. They won out over teams from Coláiste Chroí Mhuire, An Spidéal, Coláiste Eoin, Booterstown, Dublin and Coláiste Íosagáin, Booterstown, Dublin. Proud teachers Ciara Ní Shé and Méabh Breathnach helped and directed the team on their road to victory throughout the competition. The Coláiste Chroí Mhuire team ( Aoife Nic Dhonncha, Siobhán Ní Neachtain and Aisling Ní Chonghaile) won the senior section of the competition against teams from Scoil Chuimsitheach Chiaráin, An Cheathrú Rua, Coláiste Pobail Ráth Chairn, Co. na Mí and once again, Coláiste Eoin, Baile an Bhóthair, Baile Átha Cliath. The school has a long tradition in debating, and school Principal, Tríona Uí Mhurchú, who mentored the team, was extremely proud of her pupils’ great achievement, particularly as two members of the tea, Siobhán and Aisling, won the junior title at the 2017 final ! On this occasion, their motion for debate was ‘Is córas roghnúcháin cothrom é córas na bpointí!’ ( The points system is a fair selection process ! ), a subject close to the hearts of these senior students, and many interesting arguments were put forward and refuted by each speaker in turn! Professor Ciarán Ó hÓgartaigh, President, NUI Galway,was the guest chairperson on the night. A former winner of the competition, he recalled memories of debates he had taken part in, and commented that the experience had stood to him along the way in his chosen career. He praised all the young orators for their command of current affairs, and contributed his own opinions on the motions debated by both the junior and senior teams, in particular on the points system ! The winning teams in each section, juniors Pobalscoil Chorca Dhuibhne and seniors Coláiste Chroí Mhuire, were each presented with the Gael Linn perpetual trophy and a voucher worth €1,000, while vouchers worth €250 each were awarded to the other teams who had participated.Congratulating the winners on their great achievement, Gael Linn CEO Antoine Ó Coileáin said: ‘It is hugely important that pupils educated through Irish are encouraged and supported. Gael Linn is delighted with the high level of participation and the standard exhibited in this year’s debating competition. We are indebted to teachers for their on-going support for the debates’.